The Sun is our closet star, and is like most stars in our galaxy, it is about 865,000 miles in diameter, about 750 times more massive than all the other bodies in our solar system combined. It lies on the average 93 million miles from Earth, which equals one astronomical unit (AU). The surface that you see in the pictures is called the Photosphere, its temperature is about 11,000 degrees F. Above that is the Chromosphere (you can only see the Chromosphere during a total eclipse or with special filters that cost 1000 dollars and more, that view light in the H-alpha channel) The Sun rotates on its axis once every 25 days or so. 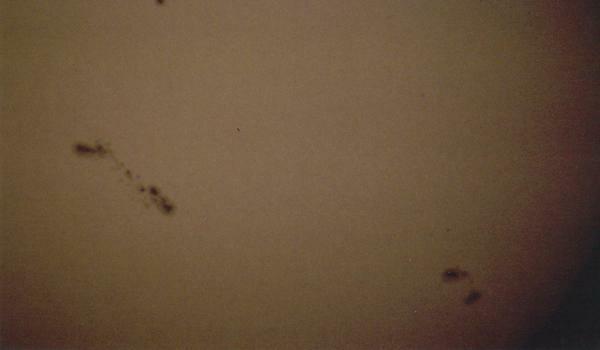 The sunspots in the images are cooler regions in the Suns surface. The umbra is the darker inner region and the penumbra is the lighter outer region. Sunspots can give off massive solar flares, if these flares are directed towards the Earth and hit its magnitic field they can cause the Aurora Borealis. 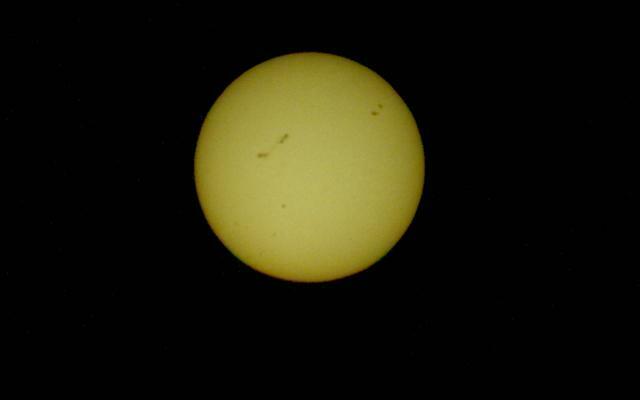 The sunspot 9690 left of center is 15 times longer than the Earth is wide.